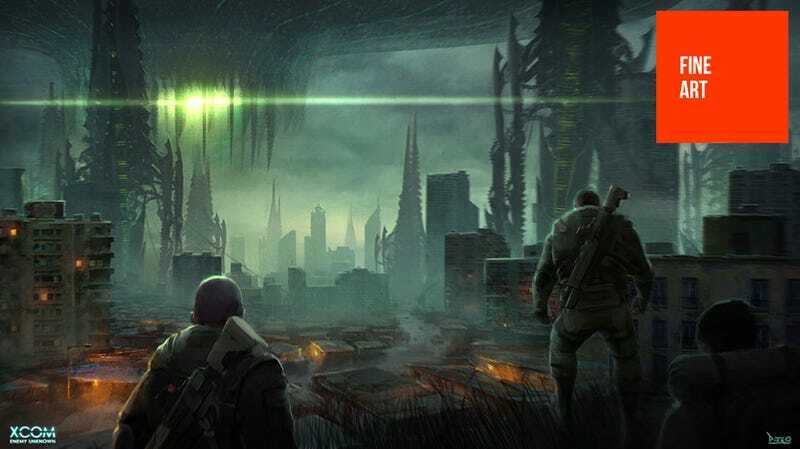 Did you like that XCOM art we posted yesterday? Well, one of the artists behind it was Piero Macgowan, and tonight we're going to taking a closer look at his work. Mexican-born Macgowan works at Civilization and (duh) XCOM studio Firaxis as a Senior Concept Artist, which means in addition to the alien-fighting pics you'll see below he's also worked on the...Civilization series (you'll also see some non-game stuff below, before you ask who the hell the guy with the flaming head is). The image you see above is an interesting one, born from the earliest stages of XCOM's development where the team was kicking around ideas. One of them was to change the game's storyline, dropping the player in a world which the aliens had already conquered. What a bummer. If you'd like to see more of Piero's work, you should check out his personal site and CGHub page.